First and foremost we practice an unyielding commitment to safety. Whether in training or operationally deployed, job safety analysis determines every action in dive operations. Our instructors expect each student to embrace this same commitment, and we take pride in providing them with the knowledge and skills to adhere to these expectations. Our second principle is gainful employment and advancement in the commercial diving industry. Through constant networking with industry professionals, we are able to determine what skills and certifications the dive companies desire in new divers and dive tenders. Divers Institute is here not just to get graduates a job, but to help them throughout their career years after graduation. 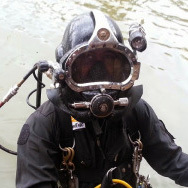 The school’s location near the Puget Sound creates training situations that are as close as possible to the actual environments professional divers will encounter. – Frankie PaullDiver at Marine Solutions Inc.